The Peter Davison items, a Script from Ressurrection Of The Daleks and a Sea Devil Costume from Warriors Of The Deep both sold, the latter for £2,280 nearly double its estimate of £800 to £1,200. 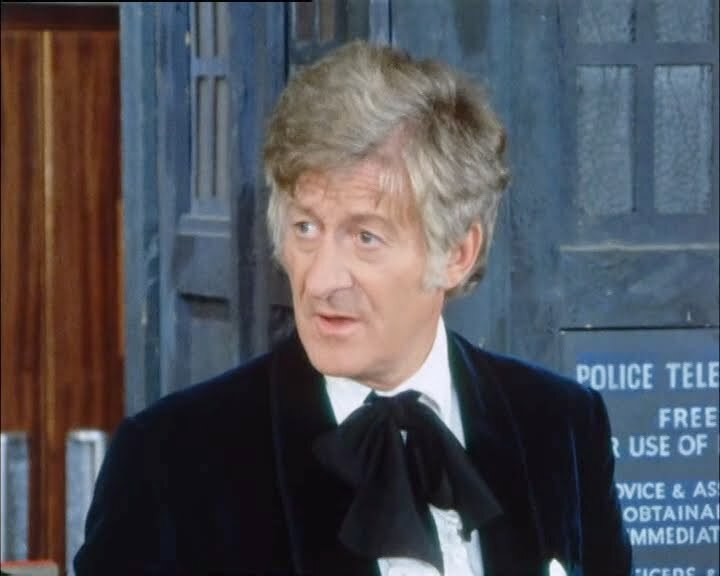 You had to read very carefully between the lines to understand what it actually was, as it is not a screen-worn item from The Doctor’s wardrobe. 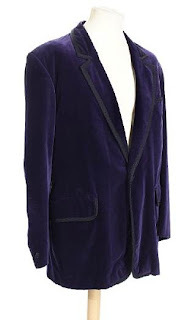 Instead I think it was one of a number of jackets Jon Pertwee had and wore at conventions and personally appearances. A previous one had been sold at another Bonham’s auction on 16th June 2009 (see left). That jacket had been worn in Dimensions In Time as well as on the old BBC VHS releases from the 1990s (see below). The jacket in this month’s sale is, I believe, a similar fair, and it just so happens that a photo in the current issue of Doctor Who Magazine confirms it! It show Jon at one of the convention interview sessions along with Tom Baker, Peter Davison and Patrick Troughton. 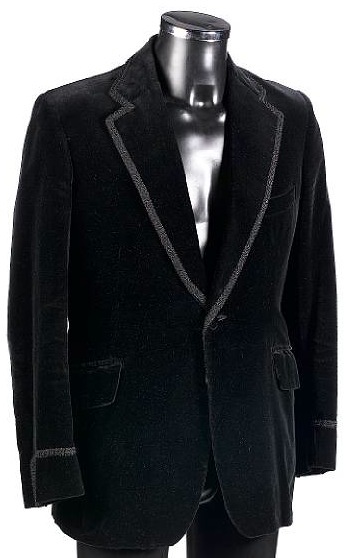 All are in costume, or wearing something resembling their costumes, including Jon who is sporting a black smoking jacket, looking like the one in the auction (see below). The one missing part of the puzzle is how it comes to be for sale - who Dewey is - and what the inscription means and how it came about. I am guessing (somebody please correct or confirm if you know for sure) that it was sold or given to the said Dewey and was signed as part of the handover. I would suspect the comment: My very own! Worn for ''The Doc'' back in '69!! is merely a comment that it was like the one he wore for his first season. His jacket for that year was a midnight blue with a shawl collar, and does not have a notch in it between the collar and lapel (see right). Taking advantage of seeing the jacket at first-hand, I took a picture of the label inside it. I need to check with Austin Reed to see if it can be dated, but it looks more 1980s than 1960s in styling. It’s a shame it muddies the waters on the history of jackets like this. You sure it's not the black jacket from Planet of the Spiders?